Nokia’s Android smartphone codenamed Nokia Normandy has leaked time and again and today we have another leak thanks again to @evleaks and this time we get to see what Nokia’s Android interface would look like. The pictures show a green Nokia Normandy which seems to be running what should be Nokia’s forked Android interface as the interface looks no where near to any Android UI we have seen. What we get from the interface is that Nokia’s forked Android UI will be reminiscent of Nokia’s iconic N9 Meego Harmattan UI and recent Asha touch devices. The lockscreen is similar to the lockscreen of the current Asha devices and it also looks a bit like the Fastlane interface. 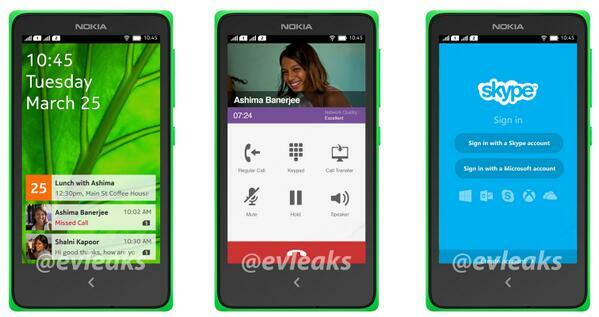 The device will be a dual-SIM one as we can see and we see Skype running on the device. From the names seen on the screenshot, we guess it might come to India pretty soon. There is a lot of uncertainty around the device with earlier reports saying that the device has been scrapped off but recently we came across another report which said that Nokia Normandy’s death might be highly exaggerated and that the device is still in development. What i personally believe is that the device will be released at MWC next month but we never know it might still be scrapped off. What do you think? Will you buy a Nokia device running forked Android?